Measurement, testing, and evaluation to continually improve quality and design on the website are integral parts of your job if you want to increase your conversions and supposedly what you need to do every day. What is A / B testing and how does it work? 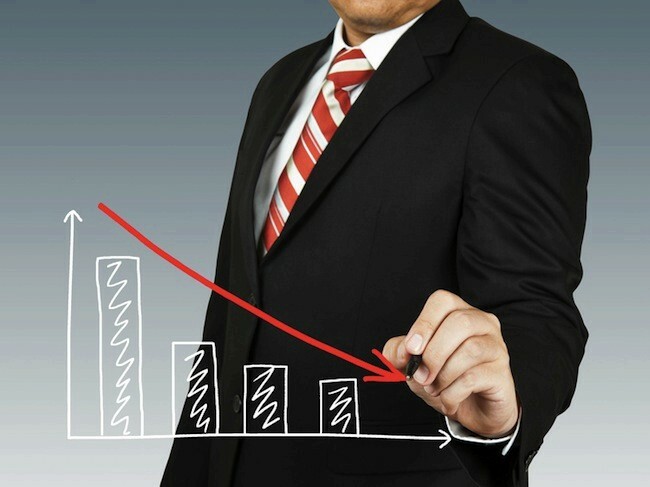 This article will introduce you with information analysis tools that help advertisers and webmasters to track how many visitors they have, where they come from, what they have done on the website, whether they make a purchase or do something that you expect them to do, why and why not, etc. Some tools will focus on analytics while some other will provide additional features such as tracking users’ interest and displaying it using heatmap and A / B testing. The tools outlined in this article are not the only ones as there are many other similar tools on the market. Each tool has similar features, but it also has its own specialization and it is up to the user to decide which tool is best for him or her from time to time. Google Analytics can also link to other Google tools like Adwords and the Webmaster Tool to connect and view parameters in the same interface. There’s no point in arguing that this is the most powerful analytical tool that users can find in the marketplace for free, which Google constantly improves, so it’s almost always capable of adapting any of tracking requirement that users want as long as they know how to do it. Most websites can use this tool only with the free version and really only need the Premium version when the amount of visit exceeds millions every month or need more advanced features, direct support from Google, more updated and more information, etc. Moreover, the price of 150,000 dollars a year is unbelievable to the majority of users and only some companies will spend this much money . But the cons is that with so many features, the interface and usage of Google Analytics can be a little bit complicated and difficult for newcomers and require users to know about the technology to be able to set up effectively. However, with a large number of users, you can always find answers from the community if you have questions about how to use it. More about the difference between Google Analytics Free and Premium versions. + Recording video: A video recording all visitor’s actions, allowing users to know exactly how the visit happens on the website. + Mouse move heatmap: A graph showing the mouse movement of visitors, indicating which area is where the user’s eyes are most focused. 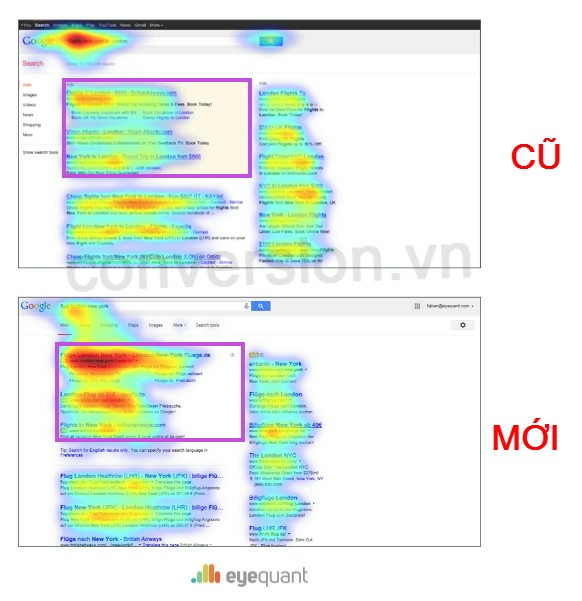 + Mouse click heatmap: The chart shows the clicking action of visitors, indicating which area receives the most clicks. 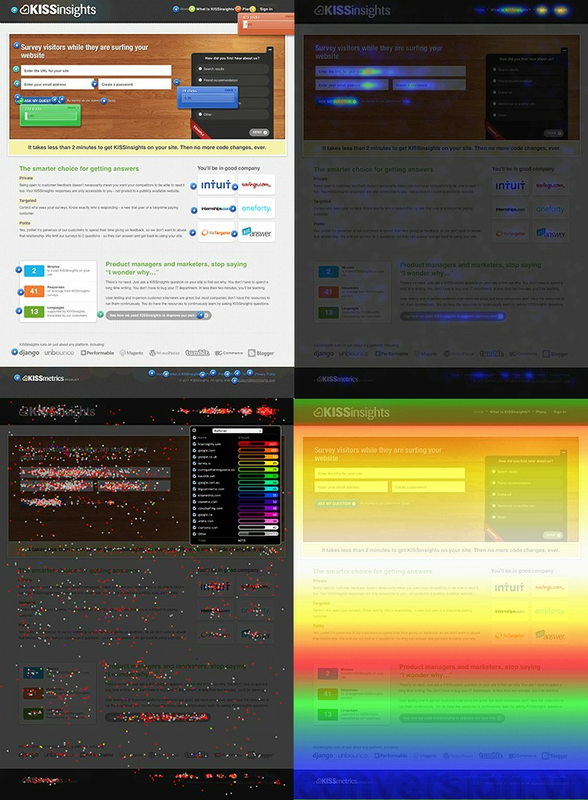 + Mouse scroll heatmap: A graph showing the mouse scrolling of a visitor on a web page which allows you to see which areas are most commonly read. + Funnel and graph report showing conversion rates on the web with multiple filters and options. + Analyzing the information filling boxes on the website and indicating the effectiveness of each item. 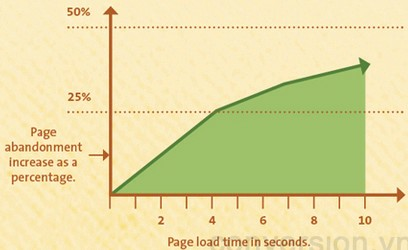 + Segmenting the information to know which factors have the greatest impact on your site. + Connecting with many other services like Google Analytics, ComScore Digital Analytix, Adobe Analytics, MailChimp, Optimizely … more. The behavioral information that ClickTale provides is especially useful when you conduct A / B testing. 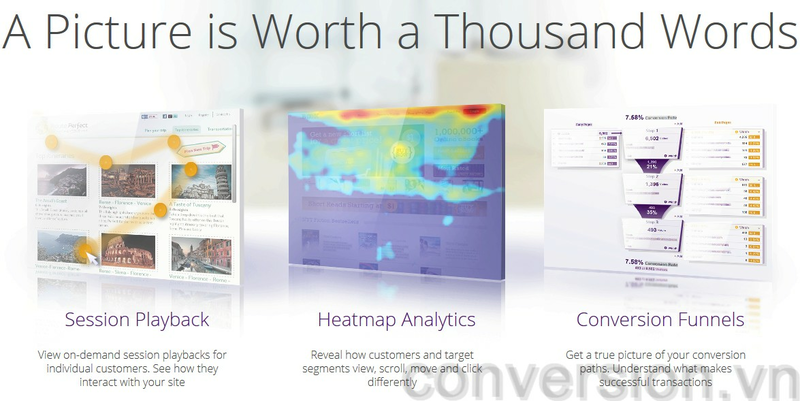 Through the heatmap, users can easily see what part of the website design needs to improve to attract clicks and increase conversions. The strength of ClickTale is that it has a very easy-to-use, easy-to-understand and user-friendly interface. The process of attaching the tracking code to the website is easy because the tool has detailed instructions, supports most CMSs and popular website formats. Finally, ClickTale has a free version with limited number of recordings per day and some extra features, so you can easily try it out to see if it is suitable. The Premium version will have the quote depending on the your using need, this requires contacting the developer for knowing the quota. If there is a time when you need to conduct A / B testing and want to know visually and clearly the behavior of the user, ClickTale may be the best candidate. Provided by: Crazy Egg, Inc.
+ Heatmap: Record clicks to show hot spots on the web pages where visitors are most likely to look at, click, and focus. + Scrollmap: This is similar to the mouse scroll heatmap, which tracks scrolls on the web pages, and then shows where the user is most focused. + Overlay: Shows the percentage of click attribution on the site and indicates where users are most likely to click. 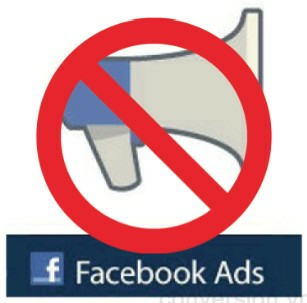 + Confetti: Classifying the click which takes place on the chart based on the traffic source, users can see where visitors from Facebook often click and how their behavior is different from visitors from Google or the other souces. Crazy Egg does not have the funnel display feature like ClickTale, which helps you know the visitors from which channel make the purchase or generate a conversion, this just allow you to see what they do on the website. The heatmap of Crazy Egg will be very useful to let you know what needs to be adjusted regarding the design and layout of the site so that it can increase conversion and achieve higher efficiency. Crazy Egg has a 30-day free trial period so you can decide whether you want to use this tool or not. And because Crazy Egg is completely focused on providing heatmap to your pages, the starting price is pretty cheap at about $ 9 per month but will be limited with the number of pages and visitors for tracking. It has less features than Clicktale but the price seems softer, depending on your needs, this is also a tool you can consider to try. EyeQuant is another analysis tool related to user behavior and heatmap expression, but the difference between this tool and other tools is that it can give you instant information. not wait. For other analytical tools, after installation, you will have to wait for information such as visitors, mouse clicks appearing on the site to analyze then. So usually when you install the analytical tools you sometimes have to wait at least a few hours, a day, or even a few days before you have enough information to make the decision and make the change, such as A / B testing. And while implementing A / B testing, it will take you some other time to gather more information for editing, this process can take a long time to make changes to increase the conversion to the website. 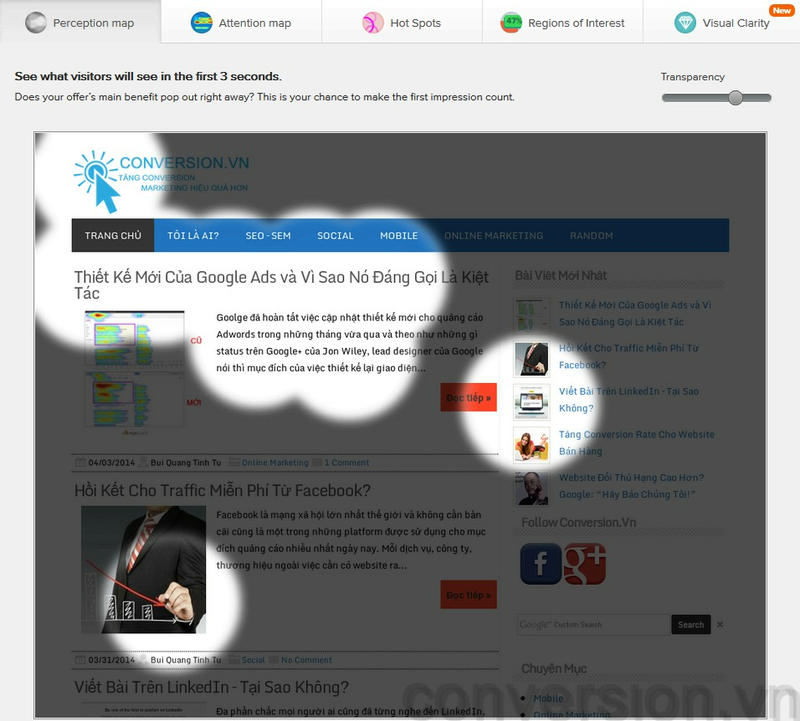 At this point EyeQuant gives you a more time-saving solution by displaying eye-tracking, heatmap information when you enter the URL of the site. After a few tens of seconds of analysis, you will get the results immediately. + Perception map: The map shows what impresses the visitors immediately in the first 3 seconds of entering the site. + Attention map: The map shows which areas attract the most visitors on the site. + Hotspot: This shows some hot spots on the site, where you should leave the important information that visitors want. + Regions of interest: The regions which are impressive with over 50% of visitors, you should ensure the important information also appears on these 50% of the impression areas. + Visual clarity: This function will check whether your site is clear and easy to view, whether it makes viewers confused or not. + There are also two different display modes: new visitors and returning visitors, which give you more information about each kind of customer. At this point many people will ask, if there is no information (ie not measuring the process of visitors on the website and places that they click on) how can this tool produce such results? WhiteMatter Labs GmbH is a center conducting researches on brain awareness and the application of those researches into advertising and marketing. The research lab have conducted extensive eye-tracking experiments and incorporated such information into the computer system, taught them how to recognize the interface as the human eye. According to EyeQuant, these results are 90% more accurate than common eye-tracking tests (which are expensive and time-consuming). You can find more information about this technology on the EyeQuant website. You can try this tool for free, test it with 2 websites you want and receive support emails on how to make a better site directly from EyeQuant team and if you find it useful, you can use the paid services at rates ranging from $ 199 per month. You can also compare the accuracy of this tool with other tools to make a decision for yourself, but if EyeQuant is really what they self-introduce, this tool can save a lot of time for the company to conduct A / B testing and improve the quality of the website to increase conversions. + You can adjust the appearance of your pages, content, text, buttons, colors and many other things visually on the Editor feature of this tool. + You can creat a new interface quickly, put online and start testing right away. + You can select objects, targets to test. + You can track clicking, conversion, registration or any parameters by setting goals. + You can schedule any testing time. 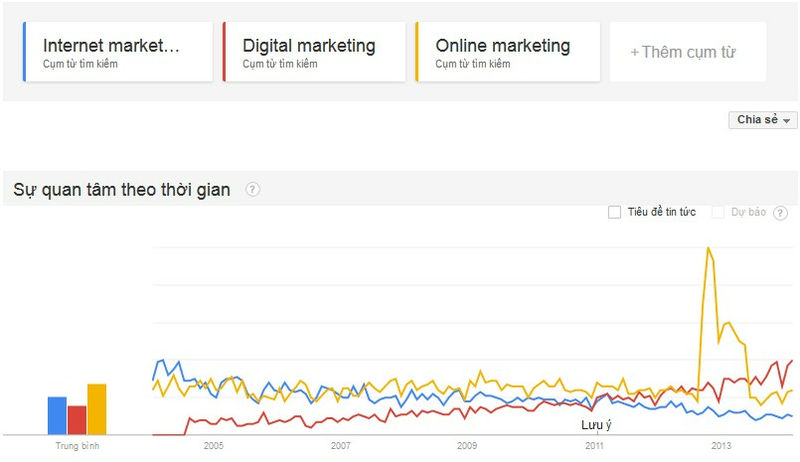 + It can connect to Google Analytics, KISSmetrics, ClickTale, etc. 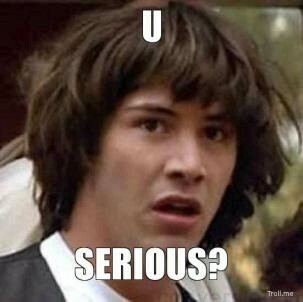 to incorporate information from testing. + It has a mobile application (at the time of writing there is only a version for iOS). Optimizely enables testing and optimization in a quick and easy way. Optimizely has a full 30 day trial version with full features and the installation is simple and fast, the paid version starts at $ 17 per month. Optimizely also offers different solutions for different types of websites and needs such as: for personal websites, for e-commerce, for agency, for publishers, for business. Each solution will have different settings that suit the user. If you are looking to improve conversions but have trouble with website optimization due to limited design or programming capabilities or you are looking for a faster process then Optimizely can be one of the the solving methods you are looking for. Final note to this article is that when choosing an analytics tool, you should consider your true needs and then evaluate which application will best fit. Try out different tools to find the most appropriate tool for your site and model. There are also a few things you should know, that some of these tools will work much better if you combine them together. For example, use the combination of Google Analytics and Crazy Egg to gather more complete and clear information about user behavior or the combination of ClickTale and Optimzely to conduct A / B testing quickly and efficiently, etc. This article may be expanded in the future to introduce some other tools which are equivalently useful, however I should not bring all of them here. 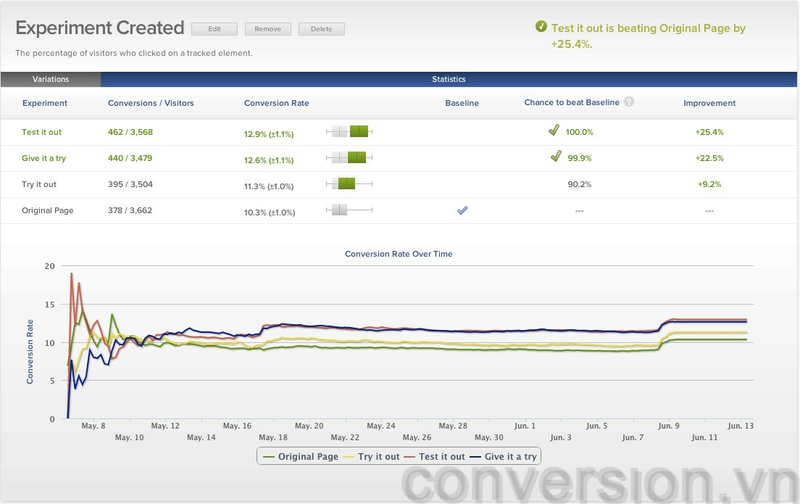 If any of you is using any tool for analyzing and improving conversion then please share here.